The SK-2520 U3.1 is a dual-bay storage enclosure with hardware RAID, designed for two 2.5-inch SATA drives. 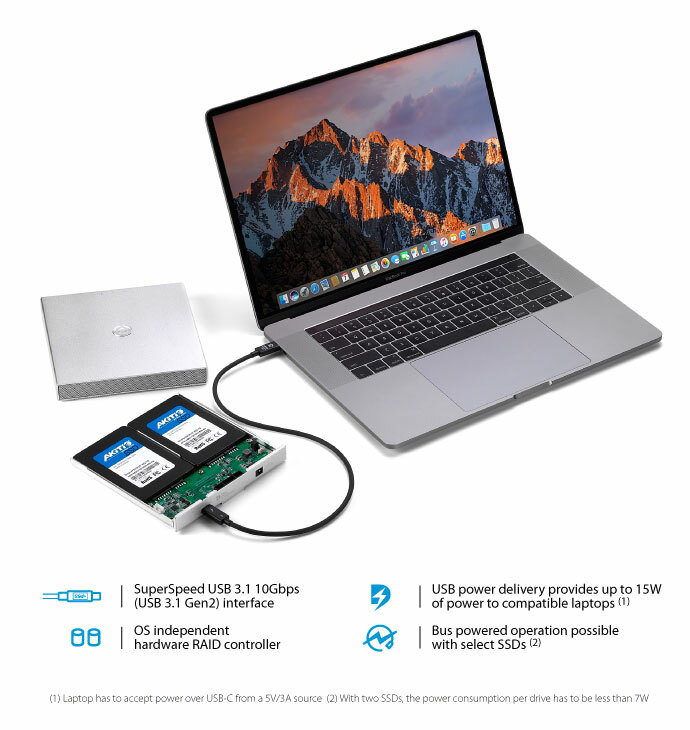 In combination with two striped SSDs and its fast SuperSpeed USB 3.1 10Gbps (USB 3.1 Gen 2) interface, this bus powered storage drive can deliver speeds up to around 800-900 MB/s. By incorporating the latest SuperSpeed USB 10Gbps (USB 3.1 Gen 2) technology, the SK-2520 U3.1 is able to deliver up to twice the speed of the USB 3.1 Gen 1 interface which runs at only 5Gbps. 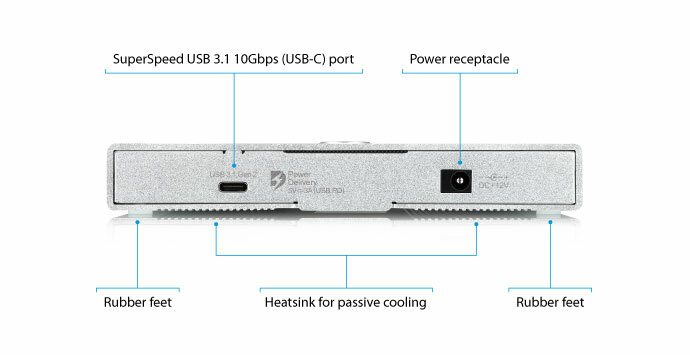 At the same time, with a corresponding USB-C to USB adapter cable, the device is still backwards compatible with the widely used USB 3.0 and USB 2.0 technology. The reversible USB Type-C (USB-C) connector enhances ease of use for connecting USB devices with a focus on minimizing user confusion for plug and cable orientation. When the external power adapter is plugged into the device the SK-2520 U3.1 supports power delivery (PD) over USB-C, providing 15W of power to laptops like the MacBook Pro (late 2016) that support charging from a 5V/3A power source. This allows you to work with the external drive without the battery levels of your laptop dropping even when the laptop is not plugged into any other power source. This portable and compact USB drive can run on bus power alone without the need for an extra power adapter if the host computer provides sufficient bus power and the drive's power consumption stays below 7W per drive. An external power adapter is included if bus power is insufficient. 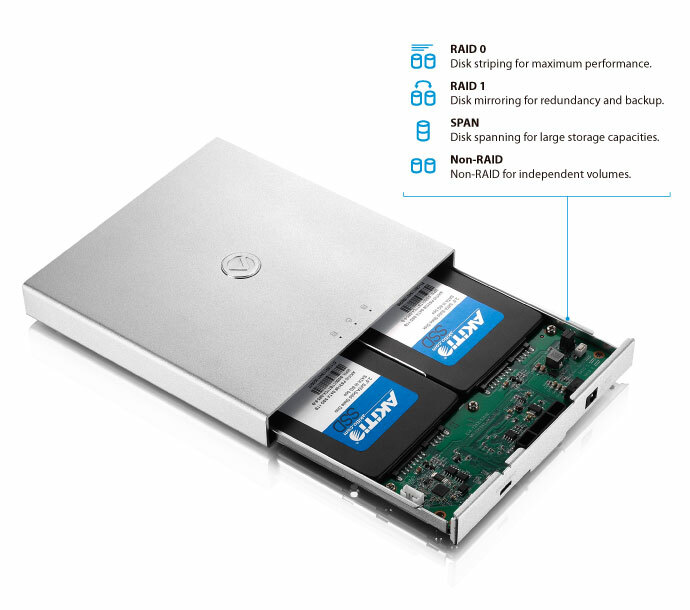 With the built-in hardware RAID controller you can mirror the drives with RAID 1 as a reliable backup for your important data, stripe the drives with RAID 0 for optimal performance and maximum transfer rates or you can select SPAN to combine the drives for large storage capacities. 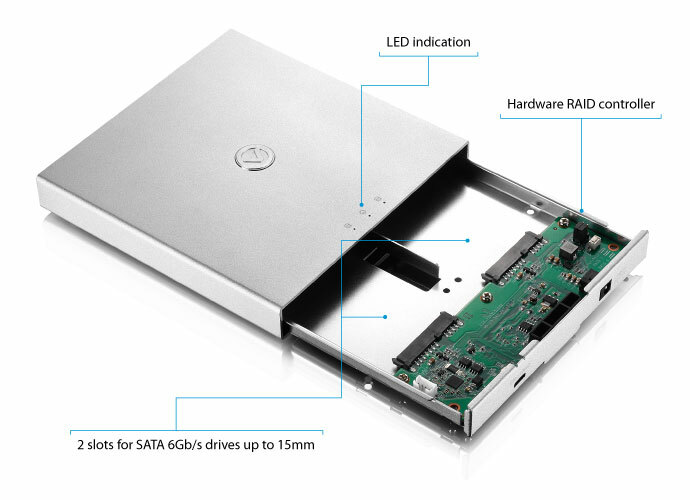 Even individually with Non-RAID, the SATA 6Gb/s interface allows each drive to run at full SATA-III speeds. 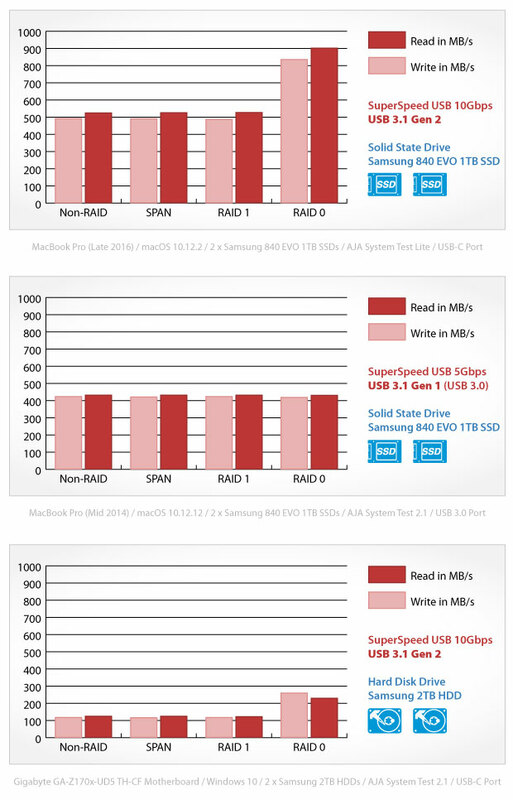 Results will vary depending on the test environment and the drives but for the best performance, install one or two SATA 6Gb/s SSDs and connect the device to a computer that supports USB 3.1 Gen 2 at 10Gbps. When connected to a computer that supports only USB 3.1 Gen 1 at 5Gbps or USB 3.0, the speed is limited by the interface to around 400 MB/s. For traditional spinning hard disk drives (HDDs), the transfer rate is limited by the drive to around 100 MB/s. For best performance and power delivery (PD), use the included USB-C cable. This enclosure is NOT compatible with drives that require 12V (e.g. Seagate Constellation or WD VelociRaptor). If bus power is insufficient (e.g. for two drives with a power consumption of more than 7W per drive), the power adapter is required. Otherwise, the data or the disk may be damaged. This product is backwards compatible with USB 3.0 but it requires a separate USB-C to USB adapter cable. (1) Optional part, not included in standard package. (2) Includes only one type of plug, depending on the country of purchase. Remarks: Included parts and components may vary and can change without prior notice!